In celebration of Presidents’ Day, Feb. 15, our founding fathers would probably prefer you to actually pay attention to the issues in our next election. But buying a car is more fun, and you will do much better if you start your shopping in advance. 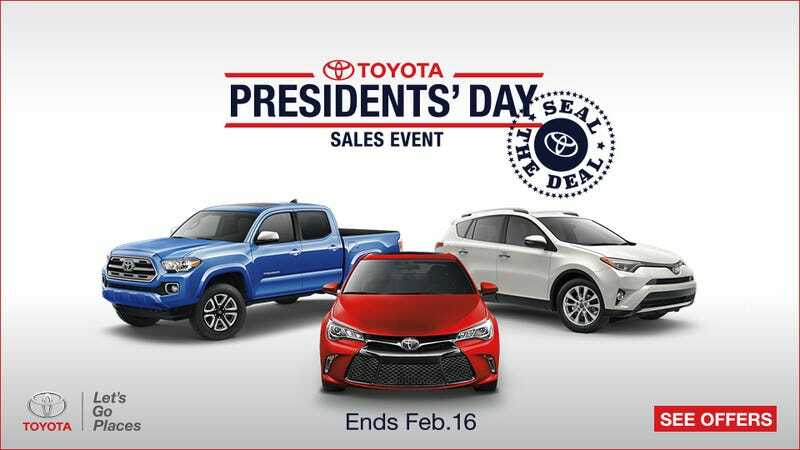 Is Presidents’ Day Weekend Really The Best Time To Buy? That’s an adage you hear quite a bit, the best time to buy really depends on the individual customer. Taking advantage of a dealership’s “sale” isn’t the same as buying some clothes at a retail store. You’d be surprised how many people who were not in the market for a car are now browsing for one because they think there is a deal to be had. If your current ride is paid off and treating you well, the best “deal” you can get is to keep your money in the bank. On the other hand, if it is time to get something new, shopping now could be advantageous. From an industry standpoint, January and February tend to be slow months for dealerships. In areas that are impacted by winter weather, folks are less likely to purchase vehicles and inventory builds up (although the northeast blizzard certainly didn’t affect things too much last month.) Dealers and automakers will offer discounts to move units off the lot. The big caveat to all this is it depends on the car. The car you want may be very popular which results in a limited inventory for that model. Last year at this time, everyone wanted the all-new Subaru Outback. Dealers were not offering any special discounts because they had waiting lists and well-equipped models were selling before they arrived on the lots. Just because a model is brand new doesn’t necessarily mean you will have to pay top-dollar, though you should do some research and see what the inventory situation is on your desired model. I should also mention if you are shopping for a pre-owned car, holiday weekends don’t have much of an impact on sale prices as there are no factory incentives to be applied. You may be better off looking for used vehicles after the holiday, as pre-owned inventory will increase with trade-ins. Are The Big Sales Only On Presidents’ Weekend? All the commercials that will infiltrate your radio and television over the next few weeks will try to convince you that Presidents’ weekend will be your only opportunity to take advantage of the HUGE SAVINGS!!! While some dealers may run some unique specials, most of the sales will be based on the discounts from the manufacturer. Offers like cash-back and low-interest financing last all month long. Furthermore, dealers care more about how many sales they make in a month than in a single weekend. An aggressive dealer will most likely give you the same price before or after the holiday weekend. The key to getting the best deal is to use the dealerships desire to sell a lot of units that month to your advantage. Is It Better To Negotiate At The Dealership? There are two schools of thought on this. Some folks say that if you physically at the dealership and ready to buy a good dealer will offer you an aggressive price to close the deal. While this is true, you are at a disadvantage because the only way to know whether or not that price is indeed the best is to compare it to another quote. What you don’t want to do is spend hours upon hours driving from dealer to dealer getting quotes; that is waste of your time. Also, dealerships on holiday sale weekends tend to be very crowded. This means you will wait longer to get any kind of real numbers to process. The more you wait, the more likely you are to accept an offer just to get out of there. Car buying should not be an all-day marathon. Another thing to be aware of is some high volume dealerships will hire outside salespeople to manage the extra customers. These folks often work at various dealers across the country and are specially trained to make maximum profit for the dealership. These “closers,” as they are sometimes called, are not concerned with getting repeat business, they only care about making as much money off of you as possible. All the more reason to avoid negotiating in person. If this transaction is a purchase and not a lease, I can’t stress enough getting pre-approved for your loan before going to the dealership. More often than not, the dealer will be able to match or beat the APR from your bank or credit union. You don’t want to be at the mercy of whatever interest rate they offer you, especially if you have less than stellar credit. Check the manufacturer’s websites and see what kind of incentives are being offered in your area. Keep in mind that discounts can vary from location to location, so be sure to input your zip code for the most accurate information. About a week or before you intend to buy, contact a bunch of dealers in your area. Make it clear that you want to make a purchase within a week or two and have them send you a quote in writing. Make sure that the quotes include all applicable taxes and fees, and reflect the relevant incentives in your area. Watch out for “rebate stacking,” where a dealer will add extra discounts like military and college graduate incentives that you may not qualify for. Finally, if and when you decide to visit the dealership either to take a test drive or finalize the paperwork, make an appointment. If the dealer knows when you are coming they can minimize the time it takes for them to process the paperwork. Good luck car shopping that weekend!